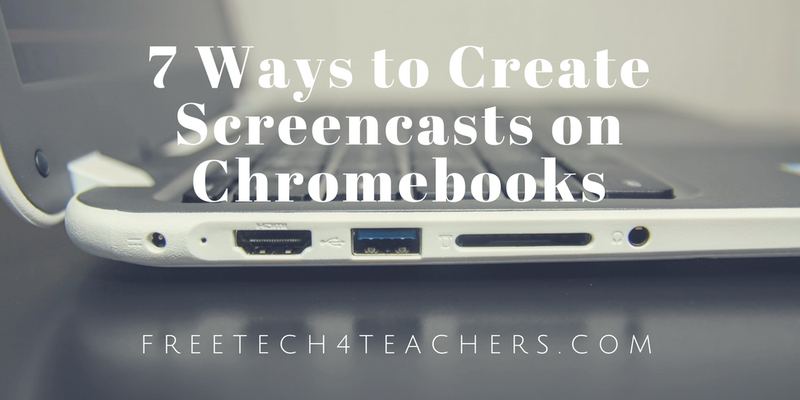 This week’s news about Screencast-o-matic has prompted me to update my list of tools for creating screencast videos on Chromebooks. All of these tools can be used by you or your students to create demonstrations of how a tool works, to create a simple video lesson in which you talk over a slideshow, or to create video blog entry with the webcam in your Chromebook. For many years Screencast-o-matic has been my favorite tool for creating screencast videos on Windows and Mac computers. Now it is available to use on Chromebooks too. To use Screencast-o-Matic on a Chromebook just go to this page and click “launch recorder.” You can record your screen or your screen and your webcam simultaneously. You can narrate your videos by using your Chromebook’s built-in microphone or by using an external mic like a Blu Snowball. The free version of Screencast-o-matic will let you record for up to 15 minutes, record as many videos as you like, and save to your Google Drive or local drive. Loom is a free screencasting tool that works on Chromebooks, Macs, and Windows computers. Loom is a Chrome extension. With Loom installed you can record your desktop, an individual tab, and or your webcam. That means that you could use Loom to just record a webcam video on a Chromebook. Of course, this also means that you can use Loom to record your webcam while also recording your desktop. Loom recordings can be up to ten minutes long. A completed recording can be shared via social media and email. You can also download your recordings as MP4 files to upload to YouTube or any other video hosting service. Loom also has a neat integration with Gmail that makes it easy to send screencasts to anyone who emails you for tech help. Click here to see how that integration works. Vidyard GoVideo is a free Chrome extension that makes it quick and easy to create and share screencast videos. With the extension installed you can record your entire screen or just one window tab. Vidyard GoVideo will let you record yourself with your webcam too. The best part of Vidyard GoVideo is that you can track who watches your video. To record on Vidyard GoVideo you simply have to click the extension icon then choose what you want to record. When you’re done recording your video is automatically stored on Vidyard GoVideo. From Vidyard GoVideo you can share your video via email and social media. If you choose to share via email, you will be able to track who watched your video. Nimbus Screenshot was my favorite tool on this list until Screencast-o-matic launched their Chromebook tool. I like Nimbus because of its ease of installation and it is the only tool on this list that provided a customizable countdown timer. I like the countdown timer because it gives me a few seconds to prepare to start talking over my screencast. The other tools just started recording the second that I hit the record button. Nimbus Screenshot was also the easiest to install and configure on my Chromebook. Screencasts recorded with Nimbus Screenshot can be saved to your local drive or to an online Nimbus account. I usually choose to save to my local drive then upload to my YouTube channel. You can also save to your local drive then send it to Google Drive or another online storage service. Screencastify probably has the most name recognition of the tools in this list. Despite a set-up process that can confuse some new users, it’s a solid product. The free version limits recordings to ten minutes, puts a watermark on the recording, and doesn’t support direct download to MP4. On the upside, there is an option to upload directly to YouTube and to share directly to Google Classroom. The sharing to Google Classroom feature is the one that most fans of Screencastify are quick to point out to me. CaptureCast lets you record your webcam while recording your screen which you cannot do with the Nimbus tool. You can choose to record your screen, your screen and your webcam, or just your screen or just your webcam. CaptureCast gives you three options for recording definition. So if you’re on a slower network you can choose a lower resolution recording to save processing time. CaptureCast lets you save a recording locally or send it to YouTube or to Vimeo. Soapbox is a free tool from Wistia that makes it easy to create great screencast videos on a Chromebook or any computer that is using the Chrome web browser. With Soapbox installed in the Chrome web browser you can quickly record your screen and your webcam at the same time. The most distinguishing feature of Soapbox is that you can have your video transition from your screen to your webcam to a combination of the two. Soapbox includes some simple editing tools for zooming in on an area of your screen and calling attention to specific parts of your screen.